Guitarist Nick Zammuto and cellist Paul de Jong met in New York in 1999 where they shared an apartment building and, after realising they shared a musical aesthetic, formed The Books. 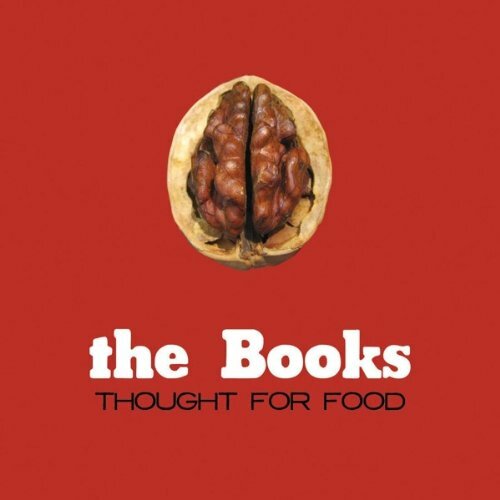 ‘Thought For Food’, released in 2002, is the first of their four albums. So far, so straightforward. From here on in it gets a little more difficult. There’s no simple label to cover what they do on ‘Thought For Food’. I’m not even going to list the labels which come closest in an attempt to substantiate this point. I’m not sure where I’d start, but i’m sure even telling you what this record is not would somehow be misleading. Telling you that the record blends acoustic and electric guitars, delicate strings, occasional vocals and percussion and then spreads this backdrop with a dark and glittering collection of vocal samples might put you in mind of The Avalanches, or any number of quirky one hit wonders. If so, we’re nowhere near. For a start, those guitars, those strings. Although exquisitely played, with every note perfectly enunciated, the instruments here, even when acoustic, are often played percussively. They are spiked, pulsating, aggravated. This is fretwork as a means of attack. There are a number of tracks wherein Zammuto plays what may well be a perfectly lilting melody, using pretty complex guitar lines, but refuses to let any notes overlap, refuses to allow harmonics and chords to form. The result is tense, troubling, and difficult in ways which are hard to specify. These urgent, disorienting pieces are shot through with samples of speech from TV, radio and films which serve only to make the experience stranger. Snatches of golf commentary, uncomfortably robotic flirting, the deadened tone of a schoolboy repeating the word ‘aleatoric’ before attempting it in a spelling bee. Winston Churchill puts in an appearance. Given its meaning (“dependant on chance, luck or uncertain outcome”) and its prominence in the album’s second track, one might expect there to be something aleatoric about The Books’ approach. However, despite the unusual results, there seems to me to be nothing left to chance at all in ‘Thought For Food’. It’s incredibly carefully assembled, with nary a note or string out of place amid all the apparently chaotic complexity. I wanted to bring it this week as it offers a complete contrast to the Mount Eerie record I offered at the last meeting. ‘Thought For Food’ is about as far from the natural world as acoustic music can get. It’s a paean to all things human. This is a man-made record and it seeks to portray the simultaneously bewildering, alientating and meaningless complexity of the world we have built. It comes across like the soundtrack to its own ‘world in a day’ documentary film. What is not clear, however, is whether it’s a hymn of celebration, or of warning. All of which perhaps sounds a little dour, a little worthy, which it shouldn’t. The record is richly rewarding, brimming with brio, enchantingly constructed and played and, in its own dark way, great fun. Its certainly one of the most singular and impressive albums of the last decade and one you should want to spend a lot of time with. Nick listened: For some reason I missed The Books in the same way as Rob missed Boredoms; around the time of this record I was listening to a lot of superficially similar music – Four Tet, Manitoba / Caribou, múm, Clue To Kalo, Cornelius, Koushik – which fell under the ‘folktronica’ banner and which mined the area between acoustic instruments and electronic manipulation. I wrote about a lot of it, was invited to contribute to a magazine in the states that specialised in stuff of this ilk, received promos by the armload of stuff like it, but somehow managed never to divert any attention towards The Books. I suspect, prosaically, predictably, stupidly, because they were called The Books, and I therefore filed them next to The Shins and all those other wimpy definite-article indie bands that were doing the rounds back then in my mental taxonomy. My loss, because this was really interesting, and I’d like to hear it (and The Lemon Of Pink) again. Tom Listened: I have tried and tried (I was going to add a third ‘tried’ but I haven’t tried THAT hard) to get into Thought for Food for many years now but never have. So I was really keen to hear it at record club and was sure that a close listen and Rob’s eloquence and insightfulness would unlock the album for me at long last. But…a bit like Tony Curtis’ character in Some Like It Hot when Marilyn is kissing him to convince him he isn’t impotent, ‘No…nothing’. I appreciate The Books are doing something very original and probably unique in producing the sound they do, and I can also see that there is great skill and vision there too but, to be honest I will probably end up playing their less well regarded third album, Lost and Safe, a whole lot more because it has those things that Thought For Food does not; you know, songs and melodies and singing and (a little) momentum and the like. And yet, despite all this, there is still a tiny little bit of me that thinks, ‘don’t give up just yet, one more try and it will all fall into place’. What to do? Graham Listened: First time listen to this band for me and immediate thoughts were confused. Slowly began to appreciate what was going on here and then managed to latch on. Complicated structure which needs to be allowed to wash over you rather than examined too much. Eventually found the minimal melodies truly absorbing, and all that in one listen!